Cisco Catalyst 6500 switches are the leading Cisco platform for converged video, voice and data networks offering unmatched security, scalability, operational manageability and virtualization ideal for mid-size and large enterprises and service providers. Port density is the highest of the Catalyst series with up to 1152 10/100 ports, 577 10/100/1000 ports, 410 SFP Gigabit Ethernet ports or 64 10-Gigabit Ethernet (10GbE) ports. Highly-scalable chassis are backwards compatible to allow new features in older line cards when the supervisor is upgraded to 720 Gbps. 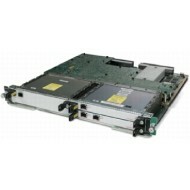 Catalyst Cisco 6500 series switches include integrated service modules that provide advanced features including, integrated wireless, TDM/analog gateway, firewalling, intrusion detection, content switching, SSL termination and network analysis services.